If your business is based in Missouri, Kentucky, Iowa, Illinois, Indiana or anywhere else in the Midwest, SEMCOR can meet all your material handling product needs. Our 35,000-square-foot St. Louis, MO facility is stocked with a large selection of high-quality heavy weight belting products, including that are perfect for high-temperature applications. We also provide unparalleled product expertise, along with attentive customer service and extensive fabrication capabilities. Heavy weight belting systems are those that generate a conveyor belting tension of at least 160 lbs. per inch of width while they are operating. They are typically used for the applications requiring the continuous haulage of heavy, bulky materials. Heavy weight belts may also be coated with PTFE or other heat-resistant compounds that are capable of withstanding high temperatures. Specific applications for heavy weight/high temperature conveyor belts include transporting heavier parts through curing ovens and cooling chambers, as well as in the manufacturing of products such as carpet tiles, vinyl flooring and rubber extrusions. SEMCOR features heavy weight belting from Fenner Dunlop, a premier provider of conveyor systems and services with more than 150 years of proven belting manufacturing expertise. Fenner Dunlop heavy weight belting systems are widely used in industries such as Aggregate/Cement, Coal, Forestry and Oil Sands. 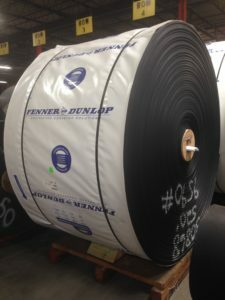 Our close partnership with Fenner Dunlop enables us to provide world-class technical support for your belting product. SEMCOR has the ability to custom fabricate heavy duty/high temperature conveyor belts to your specifications. Our 35,000-square-foot St. Louis, MO facility includes the latest fabrication equipment that allows our capable staff to provide a product for your unique applications. We also have the knowledge to suggest the most effective modifications for your belts. Get to know our heavy weight belting products by reviewing the product information found on this page. You can also contact us to obtain additional product details and to discuss your specific customization requirements.